Despite making a strong charge to the front of the pack and avoiding trouble in the three-wide chaos, Terry Woodley would cross the line just outside of the top 10 on Saturday night at Sunset Speedway. Woodley started off a night with a sixth place finish in his heat. With the APC Auto Parts United Late Models of Ontario presented by Grisdales on hand, Sunset Speedway officials would not run the Dash for Cash on Saturday night. So entering the feature with the redraw, Woodley would start near the back of the pack, set to make a strong run to the front. As of the first caution at lap three for a flat tire on Jordan Howse’s mustang, Woodley would be running 16th though. He would make his way up to the 14th spot by the third caution at lap 13 for Kendra Adams spinning in turn two. He would then make another two spots up before the fourth caution at lap 16. Over the course of the last nine laps, Woodley would solidly hold his ground, but was unfortunately unable to make up ground. As a result, he would finish just outside of the top-10 on Saturday night. Photos from the afternoon can be found on the team website at http://www.nfcmotorsports.com. Special thanks to Zeggil Custom Homes.com, CARS Collingwood Automotive Repair Services, Lil Loads, PWL Electricial, Greenview Graphics, Nottawasaga Mechanical for the continued support. 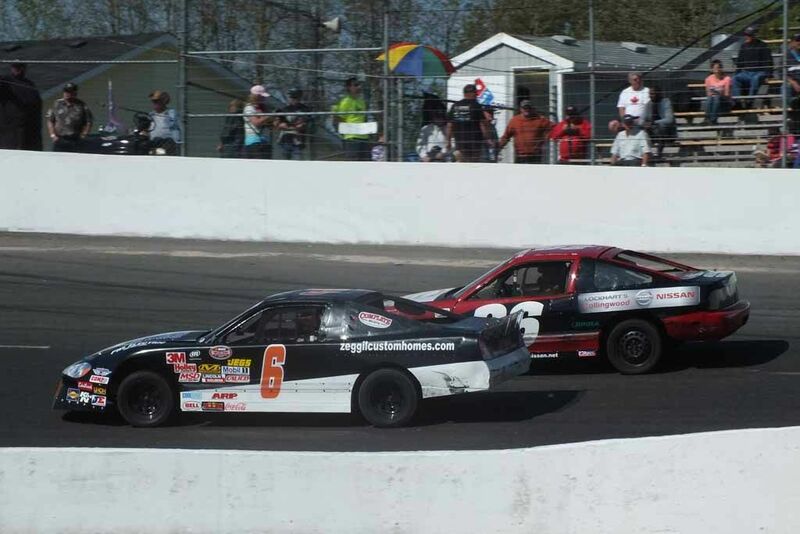 Woodley and NFC Motorsports will return to Sunset Speedway on May 30th for the fourth night of NASCAR Whelen All-American Series points competition. The night will also feature a pre-race autograph session. Details about the event can be found on the speedway website at http://www.sunsetspeedway.ca.